A vegan, long lasting and smudge free colour quad for highlights and shadows. Based on pure minerals and organic tapioca starch. Yes, it's an all natural mineral single colour eye shadow 4 pack for under $15. We can hear dance mums all over the country cheering for this one. With two highlight and two contour shades in each palette, you can create multiple looks for an amazing price. Formulated with organic macadamia nut oil, organic castor oil and minerals, this hard pressed compact colour eye shadow set creates a soft velvety texture. To intensify and enhance the colour and increase sheer staying power, use the matching natural eye shadow base underneath your colour for some extra oomph! How To Use Start with a base of eye shadow primer, then use an eye shadow brush to cover your lid. Blend colours to your liking with a larger brush or makeup sponge. Wash off at the end of the night with your favourite natural makeup remover or dampen a cotton pad with coconut oil and gently wipe away the colour. Note: the talc in this formula is naturally certified and free from contaminants. Traditionally, cheap talc can be contaminated with asbestos. This is cosmetic grade and is FDA approved as safe and asbestos free. 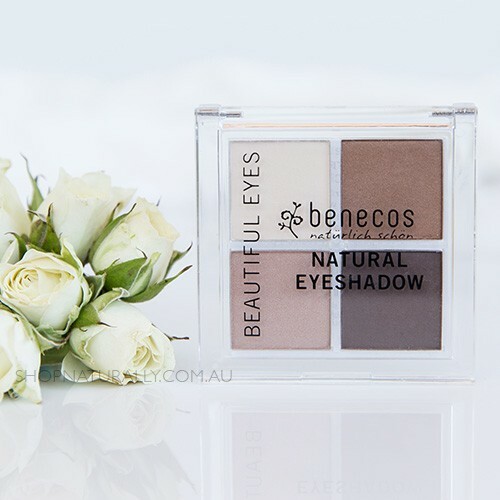 New to Australia in late 2016, Benecos is an affordable, quality natural beauty brand, making it the perfect price point for tween, teens and makeup lovers of all ages looking to make the switch to natural products without breaking the budget. All products are made using pure plant and mineral based ingredients. They are safer, cheaper and harder working than most mainstream supermarket and chemist brands. Making the switch to Benecos natural makeup is a simple one. Liked the soft colors. Good for daily makeup to work. Nice colours with good coverage. Very reasonably priced. Bought some other Benecos make up to use for my daughter's dance concert. Lovely colours. Gently on my eyes, and no irritation. Very happy.